Sharon Friends of Conservation welcomes anyone who wishes to become a monitor. 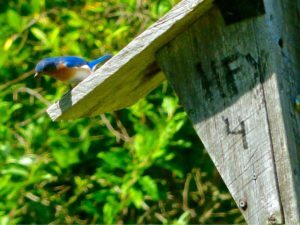 We currently have thirty bluebird houses located in various areas of Sharon. Monitors check these weekly to report new nests, eggs, nestlings and successful fledging. If you wish to become a monitor, the time required is about 1 hour per week going from March till the end of July. If you can’t make a week, someone can fill in for you. You will monitor about 6 houses. We try to assign houses near your home or close to routes you use frequently. Bluebird monitoring is a very rewarding experience. Not only do you get to know bluebird families but you discover a small gateway to the larger natural world.